The Apple iPhone is a new Apple device while top on their iPod and finally launch their revolution on communication industry. It's provides its user with the ultimate mobile device which include high quality features & new design concept. The iPhone is a mobile phone with a highly useable widescreen iPod with touch screen controls & a Internet communications device, all rolled into one portable device making it an outstanding smartphone. The casing comes with a selection of popular colours which include a sleek black gloss look finish & a sophisticated glossy white colour. The phone comes with a huge multi touch colour screen which acts as a brilliant display as well as the users input method which allows the user to control all the phones functions using the multi touch screen. The screen measures 3.5 inches and provides a screen resolution of 320 x 480 pixels on a brilliantly coloured screen. The Apple iPhone has changed the way user will use their mobile phone device & the iPhone provides the user with state of the art technology which is extremely user friendly smartphone. The iPhone operate with new Mac OS X based user interface which is based on the large multi touch colour display. The iPhone is available in two memory options which are a 4 GB version and a 8 GB memory version. The smartphone comes with a fitted battery which provides the user approximately 5 hours of talk time and up to 16 hours worth of music playback which includes call time, video time & Internet browsing time. This phone also comes with a picture address book which allows the user to see a picture of their contact as well as the contacts name. The address book is easy to access from the phones main menu & the user can make a call by simply touching the contacts details on the multi touch screen. The user will enjoy & quick & easy input method when typing messages as the iPhone will display a touch QWERTY keyboard on the 3.5 Inch screen which is a predictive keyboard & automatically corrects typing errors. The touch keyboard provides a user friendly input method & the Apple iPhone displays the typing above the keyboard which provides a real feel typing experience for the user. The email service works just like the users PC, Mac or laptop email client but the iPhone email service is a mobile email service which is easy & quick to use. The email client supports POP3 & IMAP based email service which include Apple Mac Mail, Google Email & ISP email services. 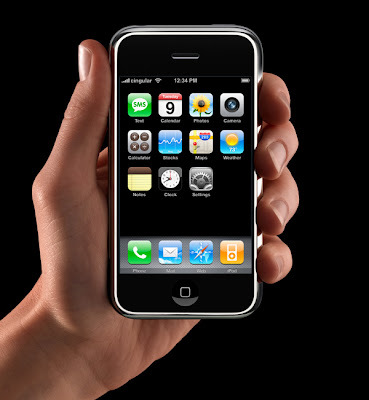 The user can enjoy a real email experience on the Apple iPhone which can include graphics, images & photo attachments. The built in music player comes with touch screen music controls which allow the user to play, pause, rewind & fast forward their choice of music. The user can view their album covers on the screen & the iPhone comes with a touch screen search facility which allows the user to search by song, album, artist or play list. The Apple iPhone comes with a built in 2 megapixels camera & video feature which allows the user to capture still photographic images & moving video footage easily with their portable device. The smartphone comes with a selection of camera & video settings which will ensure the user gets the perfect effect & finish to every photograph or video captured. The advanced photo management application provides the user with everything they need to gain the perfect finish to each & every photo. The iPhone with a smartphone function allows the user to watch their favourite TV shows & movies which makes the iPhone the perfect companion device. One of thw special feature in iPhone imaging feature is the user can view their iPhone in either portrait or landscape mode & will automatically change the viewing screen to suit the users requirements. The user can see the whole width of an Internet site or a photo in true landscape setting by simply turning the iPhone to landscape mode. The Apple iPhones comes with a Google map application which allows the user to view maps & satellite images on their phone. The maps application can provide the user with directions, & traffic information when the user is on the move. The widgets application provides the user with helpful real time information on stock reports & provides Worldwide weather reports.